Allow the spinach to defrost overnight in the fridge or quickly defrost in the microwave. Squeeze out some of the excess water. To make the sauce, gently heat the milk with the onion, bay leaves and peppercorns. Melt the butter in a saucepan before adding in the flour to form a paste called a roux, stir well to mix. Slowly start pouring in the milk, stirring constantly. Add the lemon, cream and mustard and season well. In a large baking dish lined with parchment paper, spread out the spinach. Place the cod on top and season well. Pour over the creamy sauce. 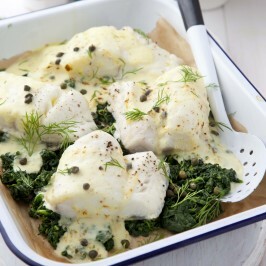 Bake at 200’C for 12 to 15 minutes until the cod is opaque and cooked through. Garnish with capers and fresh dill.